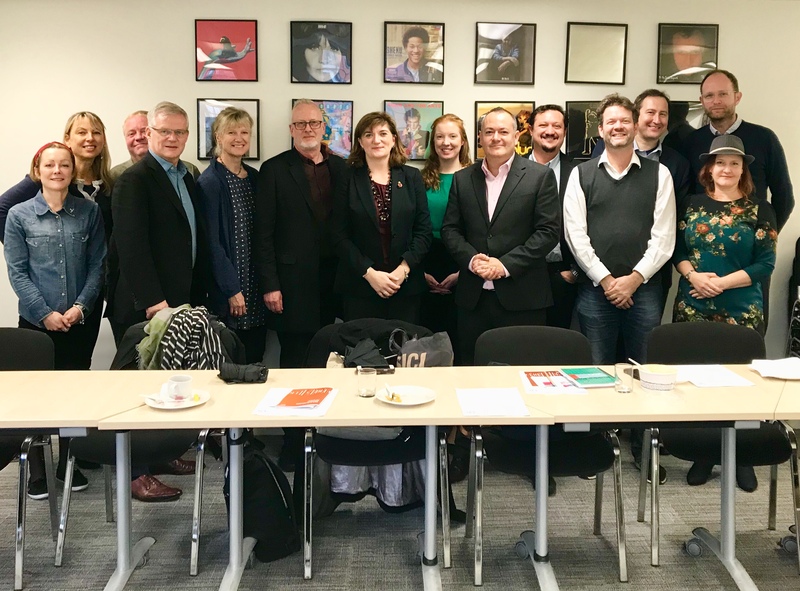 01/11/18: UK Music Board members today met with Treasury Select Committee Chair, Rt Hon Nicky Morgan MP following this week’s Budget. The meeting at UK Music HQ was the latest in our series of lunches with Select Committee chairs following previous sessions with Hilary Benn MP (Chair, House of Commons Exiting the EU Select Committee), Rachel Reeves MP (Chair, House of Commons Business, Energy and Industrial Strategy Select Committee) and Damian Collins (Chair, House of Commons Digital, Culture, Media and Sport Select Committee), Angus MacNeil MP (Chair, International Select Committee). It was attended by Lucie Caswell (FAC), Greg Parmley (UK Live Group), Annabella Coldrick (MMF), Cameron Craig (MPG), Paul Pacifico (AIM), Lynne McDowell (PPL), Horace Trubridge (MU), Ian Moss (BPI), Jackie Alway (MPA), Robert Ashcroft (PRS), Helienne Lindvall (BASCA), UK Music CEO Michael Dugher, Deputy CEO Tom Kiehl, & Head of Parliamentary Affairs Felicity Oliver. Nicky received a presentation on UK Music’s new Measuring Music report which revealed the music industry is now worth £4.5 billion to the economy with exports growing by 7 per cent over the past year. She also heard UK Music’s response to this week’s Budget where the government committed to introducing a new tax on digital services, reductions on business rates for small retailers and additional funds for schools. UK Music hopes that these new measures will be designed to support music’s talent pipeline. Nicky reported on the Committee’s role in scrutinising the Budget, holding regulators to account and conducting inquiries into SME finance, business rates, diversity & finance and household incomes. UK Music members present explained the importance of copyright to the music industry’s growth and urged Parliamentarians to consider the introduction of new fiscal incentives, such as creative sector tax credits to create new content. Members also expressed concern about the plight of music education and the need for measures to support under threat grassroots music venues.